❏ add a page (about me, contact, policy, etc) I am working on a Hire me page. 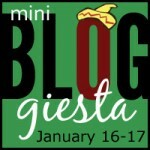 ❏ comment on other Bloggiesta partipants blogs Working on this. All and all, I think I did okay. But I possibly overdid it because I still feel awful, LOL. Next time, I need to relax a bit more.